You have already overcome three major hurdles on your way to becoming a famous actor: you've moved out of your hometown of Spudnut, changed your name from Lurleene Hickle-Plotchblowne (especially bad if you're a guy) to Petria/Petrio Lala (it sounded exotic), and developed a convincing European accent. 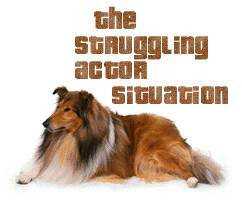 The problem is: you're not a good actor and you are not attractive by L.A. standards (well�even by Spudnut standards). Anyhow, one day after auditioning for the lead on a new sitcom called 'Try Again' they call you back and tell you that you didn't make the lead part, but you have been offered the non-speaking part of the sitcom family's pet dragon, Goo. As Goo, you would have to wear a large glittery dragon costume and communicate through a series of high-pitched grunts, exaggerated gesticulations, and clumsy leaps. However, you would receive a very generous paycheck if you sign the two-year contract. Keeping in mind that if you take this humiliating part you may be typecast for life (and humiliated), but alternately that based on your lack of talent, comeliness, etc. any chance of a job offer without experience remains bleak...what do you do?